1 On 1 April 1996 the intervener, Underberg AG, filed an application for registration of a Community trade mark at the Office for Harmonisation in the Internal Market (Trade Marks and Designs) (OHIM) pursuant to Council Regulation (EC) No 40/94 of 20 December 1993 on the Community trade mark (OJ 1994 L 11, p. 1), as amended (replaced by Council Regulation (EC) No 207/2009 of 26 February 2009 on the Community trade mark (OJ 2009 L 78, p. 1)). 3 The Community three-dimensional mark sought corresponds to the following description: ‘A greeny-brown blade of grass in a bottle, the length of the blade of grass is approximately three-quarters the height of the bottle’. 4 The goods in respect of which registration was sought are in Class 33 of the Nice Agreement of 15 June 1957 concerning the International Classification of Goods and Services for the Purpose of the Registration of Marks, as revised and amended, and correspond to the following description: ‘Spirits and liquors’. 5 The Community trade mark application was published in Community Trade Marks Bulletin No 51/2003 of 23 June 2003. 6 On 15 September 2003, Przedsiębiorstwo Polmos Białystok (Spółka Akcyjna), which was replaced by the applicant, CEDC International sp. z o.o., following a merger by acquisition in 2011, brought opposition proceedings pursuant to Article 42 of Regulation No 40/94 (now Article 41 of Regulation No 207/2009), against registration of the mark sought for the goods referred to in paragraph 4 above. 8 That three-dimensional French mark corresponds to the following description: ‘a bottle as represented above inside which a blade of grass is placed almost diagonally in the body of the bottle’. 9 The opposition was also based on German mark No 39848553, Polish marks Nos 62018, 62081 and 85811, Japanese mark No 2092826, French mark No 98746752 and unregistered signs claimed in various Member States of the European Union. 10 The grounds relied on in support of the opposition were those referred to firstly, in Article 8(1)(a) and (b) of Regulation No 40/94 (now Article 8(1)(a) and (b) of Regulation No 207/2009) on the basis of the earlier three-dimensional French mark reproduced in paragraph 7 above; secondly, in Article 8(3) of Regulation No 40/94 (now Article 8(3) of Regulation No 207/2009) on the basis of that same mark and the registered marks referred to in paragraph 9 above; and, thirdly, in Article 8(4) of Regulation No 40/94 (now Article 8(4) of Regulation No 207/2009) on the basis of the unregistered signs referred to in paragraph 9 above. 11 On 11 July 2007, the applicant adduced evidence of use of its earlier three-dimensional French mark by the time-limit of 1 August 2007 set by the Opposition Division in response to a request to that effect by the intervener. On 3 July 2008, the applicant elaborated on its arguments concerning proof of that use. 12 On 18 October 2010, the Opposition Division rejected the opposition in its entirety. 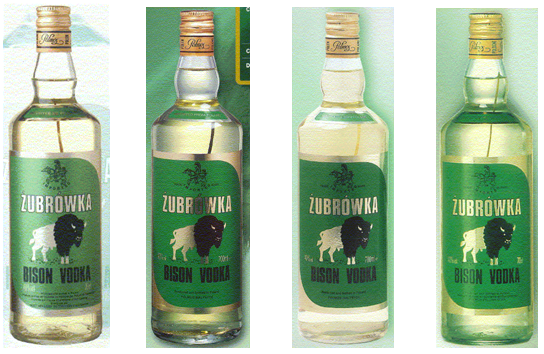 It held inter alia that the evidence provided was insufficient to establish genuine use of the earlier three-dimensional French mark and that the presence of a label containing the term ‘żubrówka’ and the representation of a bison on the bottle marketed alter the distinctive character of that mark in the form in which it was registered. 13 On 17 December 2010 the applicant filed an appeal with OHIM, under Articles 58 to 64 of Regulation No 207/2009, against the decision of the Opposition Division. On 18 February 2011, it lodged its statement setting out the grounds of the appeal, appended to which was evidence of use which had not been adduced before the Opposition Division. 14 By decision of 26 March 2012 (‘the contested decision’), the Fourth Board of Appeal of OHIM dismissed the appeal in its entirety. 16 Next the Board of Appeal considered that the French mark use of which had been proven consisted of ‘a common shaped bottle with a line on the body which runs diagonally from the left side of the bottle, starting just below the neck, to the bottom edge of the base’, as reproduced in paragraph 7 above; that the proof of use showed bottles in two different shapes but always with the same striking non-transparent ‘ZUBROWKA BISON VODKA’ label covering a large part of the bottles, and that the diagonal line was not affixed to the outside surface and did not appear on the label itself. It further found that, as a result of the presence of the label, it was impossible to see what was behind it on or in the bottles. 17 Lastly, the Board of Appeal concluded that, in those circumstances, the applicant had not proven the nature of use of its earlier three-dimensional French mark, that is to say, the use of that mark as registered or in a form differing in elements which did not alter the distinctive character of that mark in the form in which it was registered. It inferred therefrom, as that mark was the only earlier mark on which the opposition was based under Article 8(1)(a) and (b) of Regulation No 207/2009, that the opposition had to be dismissed. 18 As regards, secondly, the ground of opposition referred to in Article 8(4) of Regulation No 207/2009, the Board of Appeal held that the applicant had not proven actual use of the unregistered signs claimed in various Member States of the European Union (see paragraph 9 above), inter alia in Germany, and accordingly rejected the opposition based on that ground. 19 Thirdly, as regards the ground of opposition referred to in Article 8(3) of Regulation No 207/2009, the Board of Appeal found that the applicant had not proven either actual use of the marks relied on (see paragraph 9 above) or, in the contractual documents produced, any relationship of agency or commercial activity with the intervener and accordingly rejected the opposition based on that ground. For the sake of completeness, it added that, for some of the marks relied on, it had not been proven that the applicant was the proprietor; some had been filed after the date of application of the mark at issue; and some were not sufficiently substantiated in accordance with Rule 19 of Commission Regulation (EC) No 2868/95 of 13 December 1995 implementing Regulation No 40/94 on the Community trade mark (OJ 1995 L 303, p. 1), inter alia because they had not been translated into English, the language of the case before it. 22 The applicant produces for the first time before the Court a number of annexes comprising a judgment of the Administrative Court, Warsaw of 24 August 2011 (Annex C.2) and a decision of the Polish Patent Office of 19 October 2012 (Annex C.3), together with an extract from the 2000 Polish Law on industrial property (Annex C.4), which confirmed that Polish three-dimensional mark No 85811, representing the famous bottle with a blade of grass, owed its well-known image to the presence of the characteristic blade of grass in the bottle. It submits that those annexes ‘set out the national case-law’ and relies in that regard on the case-law of the General Court, according to which national legal decisions, even when they have not been relied on in the procedure before OHIM, have been declared admissible, with the result that neither the parties nor the Court itself can be precluded from drawing on European Union, national or international case-law for the purposes of interpreting EU law (see judgment of 1 February 2012 in Carrols v OHIM — Gambettola (Pollo Tropical CHICKEN ON THE GRILL), T‑291/09, ECR, EU:T:2012:39, paragraphs 34 and 35 and the case-law cited). 23 OHIM and the intervener challenge the admissibility of those annexes, which they argue should not be allowed on the ground that they constitute new facts. The intervener also disputes the relevance of the alleged reputation of a bottle of vodka adorned with a blade of grass in Poland in 2011 for the purpose of establishing the reputation of the earlier French mark in France from 1998 to 2003. 24 It is clear as a preliminary point that those annexes have been produced for the first time before the Court, not as judgments of national courts liable to guide the Court in the interpretation of EU law, including Regulation No 207/2009, as in the case-law referred to in paragraph 22 above, but as evidence of the alleged reputation of a Polish three-dimensional mark, by virtue of the presence of a blade of grass in that mark. 25 According to settled case-law, the purpose of bringing an action before the Court is to secure review of the legality of the decisions of the Boards of Appeal of OHIM for the purposes of Article 65 of Regulation No 207/2009. It follows from that provision that facts not submitted by the parties before the adjudicatory bodies of OHIM cannot be submitted at the stage of the action before the Court and that the Court cannot re-evaluate the factual circumstances in the light of evidence adduced for the first time before it. The legality of a decision of a Board of Appeal of OHIM must be assessed in the light of the information available to it when it adopted that decision (see judgments of 18 July 2006 in Rossi v OHIM, C‑214/05 P, ECR, EU:C:2006:494, paragraphs 50 to 52 and the case-law cited; of 18 December 2008 in Les Éditions Albert René v OHIM, C‑16/06 P, ECR, EU:C:2008:739, paragraphs 136 to 138 and the case-law cited; and of 16 January 2014 in Optilingua v OHIM — Esposito (ALPHATRAD), T‑538/12, EU:T:2014:9, paragraph 19 and the case-law cited). 26 Annexes C.2 to C.4 submitted by the applicant must therefore be rejected as inadmissible and it is not necessary to assess their probative value. 27 In any event, that evidence must also be rejected as ineffective, given that it does not relate to use of the earlier French mark at issue in the present proceedings during the relevant period, but rather to the more recent claim of reputation of a Polish mark which is territorially independent and the existence of which, in addition, had not been substantiated at all before OHIM before the relevant time-limit, as found by the Board of Appeal in paragraph 34 of the contested decision, without being contradicted on the point by the applicant in the present proceedings. 28 The applicant puts forward three pleas in law in support of its action: (i) infringement of the principle of legality and the OHIM Manual of Trade Mark Practice; (ii) infringement of Article 15(1) of Regulation No 207/2009 and Rule 22(3) of Regulation No 2868/95 and of Article 8(1)(a) and Article 42(2) and (3) of Regulation No 207/2009; and (iii) infringement of Article 75 and Article 76(1) and (2) of Regulation No 207/2009. 29 It should be noted, as a preliminary point, that the applicant challenges OHIM’s findings and assessments of all of the grounds put forward in support of the opposition, that is to say, those listed in Article 8(1)(a), Article 8(3) and Article 8(4) of Regulation No 207/2009. However, the applicant states that it was restricting its arguments solely to the Board of Appeal’s findings on the assessment of the evidence of use adduced, as those findings also concern all the grounds put forward in support of the opposition. 30 The Court considers it appropriate to begin by examining the third plea, alleging infringement of Article 75 and Article 76(1) and (2) of Regulation No 207/2009 concerning the evidence to take into account in the assessment of genuine use of the earlier French mark. 31 By this third plea, the applicant alleges that OHIM failed to examine certain facts without providing reasons for not doing so, thereby infringing Article 75 and Article 76(1) and (2) of Regulation No 207/2009. 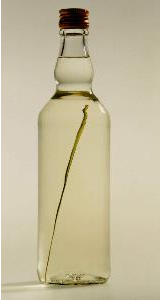 In particular, OHIM failed to examine representations produced by the applicant showing the product at issue from four different angles, not only from the front, but also from the back and the side, proving, in its submission, that the three-dimensional mark in the shape of a blade of grass in a bottle was clearly visible and had actually been used. OHIM also disregarded other evidence, such as press articles and messages published on websites, showing, in its submission, that the blade of grass in the bottle was perceived by French consumers as an original and distinctive feature and therefore one relating to the nature of use of the mark. 32 The applicant observes in that regard that as the Board of Appeal did not express any criticism as to the admissibility of the evidence appended to the statement of 18 February 2011 setting out the grounds in support of the action (see paragraph 13 above) and did not refer to Article 76(2) of Regulation No 207/2009, it is reasonable to suppose that it considered that evidence to be admissible. Even if the Board of Appeal did intend to consider that evidence inadmissible, the statement of reasons for the contested decision would in any event be vitiated in that, in such a scenario, the Board of Appeal ought to have provided an adequate statement of reasons for that assessment. The applicant refers in that regard to the Court’s case-law based on that article and goes on to state that, since the Board of Appeal neither rejected the abovementioned evidence nor denied its probative value, it was obliged to take it into account and examine it. Failure to do so constitutes an infringement of Article 75 and Article 76(1) and (2) of Regulation No 207/2009. 33 The applicant further criticises OHIM for having infringed Article 75 and Article 76(1) of Regulation No 207/2009 by failing to state reasons for its decision, in particular regarding the lack of visibility of the blade of grass in the bottle, and by examining the evidence in isolation, inter alia by failing to take account of the evidence produced in which the bottle appears from the side or the back. 34 OHIM replies that the applicant is not entitled to have taken into account evidence produced with the statement setting out the grounds for the action before the Board of Appeal, and therefore after expiry of the time-limit set by the Opposition Division. Even the discretion granted to OHIM by Article 76(2) of Regulation No 207/2009 in taking into account facts or evidence which are submitted out of time, as interpreted by the Court of Justice, is subject to there being no provision being made otherwise. Article 42(2) and (3) of Regulation No 207/2009, as implemented by Rule 22(2) of Regulation No 2868/95, contains just such a provision precluding evidence of use presented for the first time before the Board of Appeal from being taken into account. 35 OHIM also disagrees with the application in the present case of the jurisprudential exception under which additional evidence or new facts may be taken into account, taking the view that the new evidence should not be allowed to supplement the evidence that was submitted on time, because it portrays a different bottle from the one visible on the evidence submitted previously, with a long object — which might be a blade of grass — persistently shown inside a bottle, so that it is the first and only proof of use of the blade of grass inside a bottle. Nor did the applicant explain how that evidence was complementary to the evidence adduced previously, or why it did not adduce it by the time-limit set. 36 OHIM adds that it cannot be inferred therefrom that the Board of Appeal allowed the evidence submitted out of time simply because it did not reject it as inadmissible. The fact that the Board of Appeal did not include that evidence in its assessment of the nature of use tends to indicate that it decided not to take it into account. 37 OHIM considers, lastly, that even if there was a failure to provide a statement of reasons, that need not by itself lead to annulment of the contested decision where it has no bearing on the merits of the contested decision. 38 OHIM adds that the finding that no blade of grass could be seen is supported by the representations of the bottle (see paragraph 15 above) and based on the presence of the label, which covers a large part of the bottle, hiding what is behind it or in the bottle (see paragraph 16 above). It takes the view that the evidence of use adduced was taken into account as a whole and that the applicant is in reality challenging the assessment of that evidence. 39 The intervener contends that the lateral presentations of the bottle are clearly submitted out of time. First of all, they were not submitted by the time-limit set by the Opposition Division (by 1 August 2007), but only three and a half years later (on 18 February 2011) for the first time before the Board of Appeal. Next, they have no material connection to the evidence adduced previously, showing a bottle with an outwardly bulging rather than a straight neck. Nor did the applicant establish such a connection or, in particular, claim either that it was evidence of use or a supplement to evidence previously adduced. The applicant also did not put forward any arguments based on those lateral presentations during the opposition proceedings. Lastly, the reproduction of the presentations of the bottle in paragraphs 13 to 16 of the contested decision clearly indicates which ones were taken into consideration by the Board of Appeal in its exercise of discretion, all from the front, and which ones it had dismissed for having been submitted out of time. On this point, the Board of Appeal’s reasoning may be implicit, as has been recognised in the case-law. 40 The intervener further submits that OHIM provided a sufficient statement of reasons for its decision on the basis of the documents produced and could not base its assessment on probabilities or presumptions, by speculating or supposing that the blade of grass was, despite the presence of a label, visible from the side by a consumer at the time of purchase. 41 It should be noted as a preliminary point that, by its third plea alleging infringement of Article 75 and Article 76(1) and (2) of Regulation No 207/2009, the applicant submits, in essence, that the Board of Appeal erred in failing to examine evidence adduced for the first time before it, evidence which included presentations showing the bottle of vodka bearing the letters ‘Żubrówka’ from four different angles, not only from the front, but also from the back and the side, and by failing to provide reasons in that regard. 42 In that regard, it must also be recalled that, in accordance with the first sentence of Article 75 of Regulation No 207/2009, decisions of OHIM must state the reasons on which they are based. Article 50(2)(h) of Regulation No 2868/95 provides that the Board of Appeal’s decision is to contain the reasons. That obligation has the same scope as that enshrined in Article 296 TFEU. It is settled case-law that the statement of reasons required by Article 296 TFEU must set out clearly and unequivocally the reasoning of the body which adopted the act in question. That duty has two purposes: first, to allow interested parties to know the justification for the measure taken so as to enable them to protect their rights and, second, to enable the European Union Courts to exercise their power to review the legality of the decision. Whether the statement of reasons for a decision meets those requirements must be assessed with regard not only to its wording but also to its context and to all the legal rules governing the matter in question (see judgment of 8 March 2014 in Mayer Naman v OHIM — Daniel e Mayer (David Mayer), T‑498/10, EU:T:2013:117, paragraph 56 and the case-law cited). ‘1. In proceedings before it [OHIM] shall examine the facts of its own motion; however, in proceedings relating to relative grounds for refusal of registration, [OHIM] shall be restricted in this examination to the facts, evidence and arguments provided by the parties and the relief sought. 44 According to settled case-law, it is clear from the wording of Article 76(2) of Regulation No 207/2009 that, as a general rule and unless otherwise specified, the submission of facts and evidence by the parties remains possible after the expiry of the time-limits to which such submission is subject under the provisions of Regulation No 207/2009 and that OHIM is in no way prohibited from taking account of facts and evidence which are invoked or produced out of time (judgments of 13 March 2007 in OHIM v Kaul, C‑29/05 P, ECR, EU:C:2007:162, paragraph 42; of 18 July 2013 in New Yorker SHK Jeans v OHIM, C‑621/11 P, EU:C:2013:484, paragraph 22; and of 26 September 2013 in Centrotherm Systemtechnik v OHIM and centrotherm Clean Solutions, C‑610/11 P, EU:C:2013:593, paragraph 77), that is to say, after the time-limit set by the Opposition Division and, as the case may be, for the first time before the Board of Appeal. 45 In stating that OHIM ‘may’ decide to disregard facts and evidence produced out of time, Article 76(2) of Regulation No 207/2009 grants OHIM a wide discretion to decide, while giving reasons for its decision in that regard, whether or not to take such information into account (judgments in OHIM v Kaul, paragraph 44 above, EU:C:2007:162, paragraphs 43 and 68; New Yorker SHK Jeans v OHIM, paragraph 44 above, EU:C:2013:484, paragraph 23; and Centrotherm Systemtechnik v OHIM and centrotherm Clean Solutions, paragraph 44 above, EU:C:2013:593, paragraph 78). 46 Considerations relating to legal certainty and sound administration weigh in favour of OHIM’s having discretion to take into account facts and evidence submitted out of time by the parties. That discretion is, at least in respect of opposition proceedings, likely to contribute to ensuring that marks whose use could later successfully be challenged by means of annulment or infringement proceedings are not registered (see, to that effect, judgment in OHIM v Kaul, paragraph 44 above, EU:C:2007:162, paragraph 48 and the case-law cited). 47 In the present case it must be determined whether or not the Board of Appeal exercised its discretion in respect of the evidence produced for the first time before it by the applicant. 48 It is common ground that the evidence of use reproduced in paragraphs 13 to 16 of the contested decision (see paragraph 15 above) was presented by the applicant before the Opposition Division by the time–limit set by it. 49 It is also apparent from the file that, contrary to the intervener’s assertions, in pages 7 to 23 of its statement setting out the grounds of the action lodged before the Board of Appeal on 18 February 2011, the applicant produced five documents annexed to it. It is common ground that those annexes were not produced by the time-limit set by the Opposition Division. – an extract from the Wikipedia website. 51 In particular, Mr K.’s statement comprised the following information. First, Mr K. stated that, from 1970s until 2011, the applicant, formerly Przedsiębiorstwo Polmos Białystok SA, had produced Żubrówka vodka both for the Polish market and for export. According to Mr K., whilst the vodka had had a number of labels over the years, it always had been and was still designated by means of a blade of grass placed inside the bottles, protected in Poland and in several other countries with a mark consisting in a ‘bottle with a blade of grass’. Second, Mr K. added that the Żubrówka vodka with a green label produced by the applicant in bottles of 0.5, 0.7 and 1 litre had, during the period 1998 to 2003, been exported to France through the agency PHZ AGROS and subsequently directly by the applicant. He stated that, before 2000, Żubrówka vodka with a green label intended for export to France had been produced by POLMOS Poznań, but that the appearance of the bottles, labels and the blade of grass placed inside the bottles was at that time exactly the same as that adopted by the applicant beginning in 2000. Thirdly, Mr K. appended to his statement samples of photographs in order to illustrate how the bottles of Żubrówka vodka with a green label and a grass motif applied regularly in those bottles, including those intended for the French market for the period 1998 to 2003. In Mr K.’s view, those photographs illustrated incontrovertibly that a blade of grass was clearly visible for any consumer who might view the bottle from the front or the back. 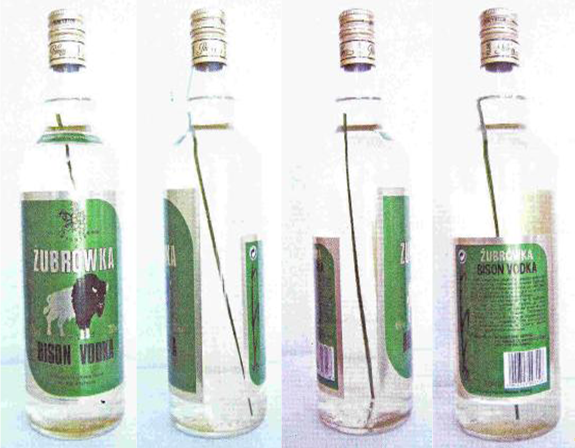 52 Also appended to Mr K.’s statement were four photographs of 700 ml bottles of Żubrówka vodka, which he stated were exported to France, showing the following four representations, in which the bottle is shown from the front, on two opposite sides and from the back. 53 In paragraphs 13 to 15 of the contested decision (see paragraph 15 above), the Board of Appeal observed that the evidence of use produced by the applicant comprised ‘among others’ two affidavits, one from the Financial Director and the President of [the applicant] and one from the CEO of Pernod SA, the exclusive distributor of [the applicant’s] ‘Żubrówka’ vodka for the territory of France, to which were appended a presentation of the vodka, leaflets aimed at French distributors concerning the years 1999 to 2002, showing four presentations and leaflets from the years 2003 to 2006 distributed by French supermarkets showing eight presentations. 54 It follows that the Board of Appeal’s statement in paragraph 16 of the contested decision, to the effect that ‘no other presentations than the ones depicted in the previous three paragraphs were submitted’ must be construed as referring to the evidence of use produced before the Opposition Division by the time-limit set by it, but not to evidence produced out of time before the Board of Appeal. 55 The conclusion must accordingly be that the Board of Appeal took into account only the evidence produced by the applicant before the Opposition Division and did not exercise its discretion to take into account evidence of use produced for the first time before it, in particular Mr K.’s statement and the photographs appended thereto, as well as the articles from the French press and the extracts from French websites. 56 The applicant is therefore incorrect in asserting that since the Board of Appeal expressed no criticism of the admissibility of the evidence attached to the statement of 18 February 2011 setting out the grounds of the action and since it did not refer to Article 76(2) of Regulation No 207/2009, it is legitimate to suppose that it considered that evidence to be admissible. As the Board of Appeal did not exercise its discretion, it could not have made an implicit finding that that evidence was admissible. 57 Moreover, according to the case-law, it is clear from the wording of Article 76(2) of Regulation No 207/2009 that the fact that a party has invoked or produced facts and evidence out of time does not confer on it an unconditional right to have those facts and evidence taken into consideration by OHIM (judgment in OHIM v Kaul, paragraph 44 above, EU:C:2007:162, paragraphs 43 and 63). In the present case, it is precisely the lateness of the production of the evidence which distinguishes the factual context of the present case from that of the case-law relied on by the applicant (judgment of 10 October 2012 in Bimbo v OHIM — Panrico (BIMBO DOUGHNUTS), T‑569/10, EU:T:2012:535, paragraph 35), in which the arguments and evidence held implicitly to be admissible had been submitted in due time. 58 OHIM is also incorrect in replying that, because the Board of Appeal did not include that new evidence in its assessment of the nature of use, that must be construed as meaning that it decided not to take it into account. In fact, as the Board of Appeal did not exercise its discretion, it could not have made an implicit finding that that evidence was admissible. 59 Even if it can be considered that OHIM did exercise its discretion to allow or not allow the evidence, it must be borne in mind that, according to the case-law, where OHIM exercises its discretion to decide whether or not to take into account a document that has been submitted out of time, it must give reasons for its decision on the matter (judgments in OHIM v Kaul, paragraph 44 above, EU:C:2007:162, paragraph 43; New Yorker SHK Jeans v OHIM, paragraph 44 above, EU:C:2013:484, paragraph 23; and Centrotherm Systemtechnik v OHIM and centrotherm Clean Solutions, paragraph 44 above, EU:C:2013:593, paragraph 78). 60 As has been observed by the Court of Justice, any taking into account by OHIM of that additional evidence is in no way a ‘favour’ granted to one party or the other, but rather must result from an objective, reasoned exercise of the discretion conferred on OHIM by Article 76(2) of Regulation No 207/2009. The statement of reasons thus required is all the more necessary when OHIM decides to reject the evidence submitted out of time (judgment in Centrotherm Systemtechnik v OHIM and centrotherm Clean Solutions, paragraph 44 above, EU:C:2013:593, paragraphs 111 and 112). 61 In the present case, it is clear that the Board of Appeal did not exercise the discretion conferred on it to decide whether or not to take into account evidence of use produced for the first time before it and did not give any reasons for its decision in that regard. The use of the term ‘among others’ in paragraph 13 of the contested decision does not cast any doubt on this conclusion and it cannot serve as an objective and reasoned exercise of that discretion for the purpose of rejecting such evidence. 62 In addition to that obligation to give reasons, the case-law has laid down criteria for the exercise of OHIM’s discretion for the purposes of potentially taking into account evidence submitted out of time. Thus, taking such facts or evidence into account is particularly likely to be justified where OHIM considers, first, that the material which has been produced late is, on the face of it, likely to be relevant to the outcome of the opposition brought before it and, second, that the stage of the proceedings at which that late submission takes place and the circumstances surrounding it do not argue against such matters being taken into account (judgments in OHIM v Kaul, paragraph 44 above, EU:C:2007:162, paragraph 44; New Yorker SHK Jeans v OHIM, paragraph 44 above, EU:C:2013:484, paragraph 33; and Centrotherm Systemtechnik v OHIM and centrotherm Clean Solutions, paragraph 44 above, EU:C:2013:593, paragraph 113). 63 In the present case, the evidence produced out of time included at the very least Mr K.’s statement and the appended presentations of the bottle, seen from the front, two opposite sides and the back (see paragraphs 50 and 51 above), and the articles from the French press and the extracts from French websites met the two requirements for being taken into account by OHIM. 64 First, Mr K.’s statement and the appended presentations of the bottle, seen from the front, two opposite sides and the back, were, prima facie, likely to be truly relevant to the outcome of the opposition brought before OHIM since, had they been taken into account, they would have been likely to call into question the Board of Appeal’s assessment set out in paragraphs 17 and 18 of the contested decision (see paragraphs 16 and 17 above): first, that ‘the diagonal line was not affixed to the outside surface and did not appear on the label itself’; second, that ‘as a result of the presence of the label, it was impossible to see what was behind it on or in the bottles’; and, third, that ‘in those circumstances, the applicant had not proven the nature of use of its earlier three-dimensional French mark’. 65 It is important to note in that regard that the three-dimensional nature of a mark such as that at issue precludes a static, two-dimensional vision and calls for a dynamic, three-dimensional perception. Thus, a three-dimensional mark may, in principle, be perceived from a number of sides by the relevant consumer. As regards proof of use of such a mark, it must therefore be taken into account not as a reproduction of how it is viewed in two dimensions, but rather as a presentation of how it is perceived in three dimensions by the relevant consumer. It follows that presentations from the side and the back of a three-dimensional mark are, as a rule, likely to be truly relevant for the purposes of assessing the genuine use of that mark and cannot be rejected solely on the ground that they are not reproductions from the front. 66 Similarly, the articles from the French press and the extracts from French websites stating, in essence, that Żubrówka vodka with the ‘famous bison grass’ ‘is easily identified thanks to the aromatic blade of grass present in the bottle’ (see paragraph 50 above), were, prima facie, likely to be relevant to the outcome of the opposition brought before OHIM, since taking them into account would have facilitated proof of genuine use of the earlier French mark on French territory during the relevant period. 67 Secondly, the stage in the proceedings at which the late production of evidence arose and the circumstances surrounding it do not argue against such evidence being taken into account by OHIM, since the applicant produced it together with its statement setting out the grounds of its action before the Board of Appeal, thereby allowing the Board to exercise its discretion in an objective, reasoned manner to decide whether or not to take the evidence into account. 68 It follows that, in accordance with the case-law referred to in paragraph 62 above, the Board of Appeal was required to exercise its discretion in an objective, reasoned manner, to decide whether or not to take into account the evidence that had been submitted out of time which fulfilled the two criteria laid down by that case-law, namely, at the very least: Mr K.’s statement and the appended presentations of the bottle, seen from the front, two opposite sides and the back, and also the articles from the French press and the extracts from French websites. 69 Accordingly, the conclusion must be that, in failing to exercise its discretion in an objective, reasoned manner, to decide whether or not to take into account the evidence of use of the earlier three-dimensional French mark produced for the first time before it, the Board of Appeal infringed Article 76(2) of Regulation No 207/2009 and also Article 75 of the same regulation by failing to give reasons for its decision on the matter. 70 This conclusion is not called into question by OHIM’s and the intervener’s assertions. 71 As a preliminary point, in so far as, before the General Court, OHIM seeks to underpin the contested decision with evidence that was not taken into account for the purposes of that decision, it must be pointed out that such additional reasons cannot be successfully relied on before this Court in order to perfect potentially inadequate reasoning in the contested decision (see, to that effect and by way of analogy, judgment of 11 December 2012 in Sina Bank v Council, T‑15/11, ECR, EU:T:2012:661, paragraph 62 and the case-law cited). 72 It must be remembered that the reasoning for a measure must be provided to the person concerned by the measure before the latter brings an action against it. Non-compliance with the duty to state reasons cannot be regularised by the fact that the person concerned becomes cognisant thereof during proceedings before the EU judicature (see, to that effect and by way of analogy, judgment in Sina Bank v Council, paragraph 71 above, EU:T:2012:661, paragraph 56 and the case-law cited). The possibility for an EU institution or body to plead such supplementary grounds in order to complete the grounds set out in the contested decision would undermine the rights of defence of the party concerned and his right to an effective judicial remedy, as well as the principle of equality of parties before the EU Courts (see, to that effect and by way of analogy, judgment of 6 September 2013 in Bateni v Council, T‑42/12 and T‑181/12, EU:T:2013:409, paragraph 54 and the case-law cited). 73 Without prejudice to the foregoing, the Court finds it appropriate to examine and refute those assertions. 74 In the first place, OHIM’s assertion that Article 42(2) and (3) of Regulation No 207/2009, as implemented by Rule 22(2) of Regulation No 2868/95, contains an ‘otherwise specified’ rule for the purposes of the case-law referred to in paragraph 44 above which precludes proof of use presented for the first time before the Board of Appeal from being taken into account, must be dismissed for the following reasons. 75 Under the heading ‘Examination of opposition’, Article 42(2) and (3) of Regulation No 207/2009 provides, in essence, that if the applicant so requests, the proprietor of an earlier Community trade mark who has given notice of opposition is to furnish proof that, during the period of five years preceding the date of publication of the Community trade mark application, the earlier Community or national trade mark has been put to genuine use in the European Union in connection with the goods or services in respect of which it is registered and which he cites as justification for his opposition, or that there are proper reasons for non-use. In the absence of proof to this effect, the opposition is to be rejected. 76 It is thus apparent that Article 42(2) and (3) of Regulation No 207/2009, as a substantive provision, does not contain any requirement as to the time-limit set for the opponent to provide proof of the earlier mark (judgment in New Yorker SHK Jeans v OHIM, paragraph 44 above, EU:C:2013:484, paragraph 24; see also, by way of analogy, judgment in Centrotherm Systemtechnik v OHIM and centrotherm Clean Solutions, paragraph 44 above, EU:C:2013:593, paragraph 79). Thus, the rejection of the opposition, in the absence of proof to this effect, results from an assessment on the merits of the evidence provided and not from non-compliance with a procedural time-limit. 77 Accordingly, Article 42(2) and (3) of Regulation No 207/2009 does not affect the discretion conferred on OHIM by Article 76(2) thereof, allowing it to decide whether or not to take into account evidence produced out of time before it. 78 Rule 22(2) of Regulation No 2868/95, meanwhile, provides that where the opposing party has to furnish proof of use or show that there are proper reasons for non-use, OHIM is to invite him to provide the proof required within such period as it is to specify. If the opposing party does not provide such proof before the time-limit expires, OHIM is to reject the opposition. 79 Similarly, Rule 40(5) of Regulation No 2868/95 states that, in the event of an application for revocation based on Article 51(1)(a) of Regulation No 207/2009, OHIM is to ask the proprietor of the Community mark to provide proof of use of the mark during a period it specifies. If the proof is not provided within the time-limit set, the Community trade mark is to be revoked. Rule 22(2) and (4) is to apply mutatis mutandis. 80 It should be borne in mind that the Court has held that Rule 40(5) of Regulation No 2868/95 did not prevent the Board of Appeal from exercising the discretion conferred on it by Article 76(2) of Regulation No 207/2009 in order to take into account any additional evidence submitted to it (see, to that effect, judgment in Centrotherm Systemtechnik v OHIM and centrotherm Clean Solutions, paragraph 44 above, EU:C:2013:593, paragraph 90). 81 The same holds true, for the same reasons, for Rule 22(2) of Regulation No 2868/95, as that rule is the equivalent for opposition proceedings of Rule 40 of the same regulation, governing revocation proceedings. 82 In this respect, although, admittedly, it is apparent from the wording of Rule 22(2) of Regulation No 2868/95 that, when no proof of use of the mark concerned is submitted within the time-limit set by OHIM, the absence of genuine use of the earlier mark must, in principle, automatically be found by OHIM, such a conclusion is not, on the other hand, inevitable when proof of use has indeed been submitted within that time-limit (judgment in New Yorker SHK Jeans v OHIM, paragraph 44 above, EU:C:2013:484, paragraph 28; see also, by way of analogy, judgment in Centrotherm Systemtechnik v OHIM and centrotherm Clean Solutions, paragraph 44 above, EU:C:2013:593, paragraph 86). 83 In such a case, and unless it appears that that evidence is irrelevant for the purposes of establishing genuine use of the mark, the proceedings are to run their course. Accordingly, OHIM is, inter alia, called upon, as provided by Article 42(1) of Regulation No 207/2009, to invite the parties, as often as necessary, to file their observations on the notifications it has sent to them or on the communications from the other parties (judgment in New Yorker SHK Jeans v OHIM, paragraph 44 above, EU:C:2013:484, paragraph 29; see also, by way of analogy, judgment in Centrotherm Systemtechnik v OHIM and centrotherm Clean Solutions, paragraph 44 above, EU:C:2013:593, paragraph 87). 84 In such a situation, if the opposition is subsequently rejected owing to lack of sufficient proof of genuine use of the earlier mark, that rejection does not result from application of Rule 22(2) of Regulation No 2868/95, a provision that is essentially procedural, but solely from the application of the substantive provisions in Article 42 of Regulation No 207/2009 (judgment in New Yorker SHK Jeans v OHIM, paragraph 44 above, EU:C:2013:484, paragraph 29; see also, by way of analogy, judgment in Centrotherm Systemtechnik v OHIM and centrotherm Clean Solutions, paragraph 44 above, EU:C:2013:593, paragraph 87). 85 It follows inter alia from the foregoing that where evidence of use of the mark was produced within the time-limit set by OHIM under Rule 22(2) of Regulation No 2868/95, the submission of additional proof of such use remains possible after the expiry of that time-limit and OHIM is in no way prohibited from taking account of evidence submitted out of time through use of the discretion conferred on it by Article 76(2) of Regulation No 207/2009 (judgment in New Yorker SHK Jeans v OHIM, paragraph 44 above, EU:C:2013:484, paragraph 30; see also, by way of analogy, judgment in Centrotherm Systemtechnik v OHIM and centrotherm Clean Solutions, paragraph 44 above, EU:C:2013:593, paragraph 88). 86 Accordingly, the conclusion is that Rule 22(2) of Regulation No 2868/95 does not prevent the Board of Appeal from exercising the discretion conferred on it by Article 76(2) of Regulation No 207/2009 in order to take into account any supplementary evidence produced for the first time before it. 87 In the present case, as observed in paragraph 48 above, it is common ground that the applicant had, by the time-limit set by OHIM, produced various pieces of evidence in order to establish use of the earlier French mark. It should also be noted that the evidence thus initially produced was not entirely irrelevant for that purpose, especially since the Board of Appeal, in paragraphs 13 to 18 of the contested decision, took it into account, whilst finding it to be insufficient. It follows that the submission of supplementary evidence, in addition to the relevant evidence produced by the time-limit set by OHIM under Rule 22(2) of Regulation No 2868/95, remained possible after the expiry of that time-limit and that OHIM was in no way prohibited from taking account of evidence submitted out of time through use of the discretion conferred on it by Article 76(2) of Regulation No 207/2009. 88 In the second place, nor can the Court uphold the assertion put forth by OHIM and the intervener, allegedly based on the case-law, that the new evidence is not complementary to that produced by the time-limit and does not even have any material connection to it, because it represents another bottle, with a bulging neck rather than a straight one, with a long object — which might be a blade of grass — persistently shown inside a bottle, so that it is the first and only proof of use of the blade of grass inside a bottle. 89 In that regard, it should be noted, first of all, that the case-law does not require a material connection between the supplementary evidence and the earlier evidence. It requires only that evidence submitted after expiry of the time-limit set by the Opposition Division not be the first and only proof of use, but that it be ‘complementary’ or ‘supplementary’ to relevant evidence which was lodged within the time-limit set (judgments in New Yorker SHK Jeans v OHIM, paragraph 44 above, EU:C:2013:484, paragraph 30, and of 29 September 2011 in New Yorker SHK Jeans v OHIM — Vallis K. — Vallis A. (FISHBONE), T‑415/09, EU:T:2011:550, paragraph 33). 90 Next, it should be remembered that nor do the criteria from the case-law referred to in paragraph 62 above require a material connection to the evidence adduced previously, although they do require an intrinsic relevance to the outcome of the proceedings before OHIM. 91 Moreover, it should be noted that that assertion by OHIM and the intervener lacks a factual basis, because it distorts the evidence produced by the time-limit set by the Opposition Division. It is in fact clear from the photographs reproduced in paragraphs 14 and 15 of the contested decision (see paragraph 15 above) that it is a blade of grass — and not just some oblong object — inside a bottle which is visible to the observer. The photographs reproduced in paragraph 52 above are accordingly not the first and only proof of use of a blade of grass inside a bottle. 92 In the third place, nor can the assertion of OHIM and the intervener that the applicant did not explain how the evidence produced for the first time before the Board of Appeal was complementary to the evidence adduced previously, nor why it had not adduced it by the time-limit set. 93 It should be noted at the outset that such an explanation is not required by the case-law referred to in paragraph 62 above. 94 It should also be observed that the applicant, in its statement setting out the grounds of its action before the Board of Appeal, in fact referred both to the decision of the Opposition Division which found the evidence of use produced before it to be insufficient and to the supplementary evidence. Thus, contrary to the intervener’s assertions, it relied on each one in support of its argument as set out in pages 2 and 3 of that statement. Such a reference is sufficient to indicate that the applicant was alleging the relevance of that evidence for the proceedings before the Board of Appeal. The Board, however, did not conduct a proper examination of the possible relevance of the supplementary evidence produced by the applicant (see, by way of analogy, judgment in Centrotherm Systemtechnik v OHIM and centrotherm Clean Solutions, paragraph 44 above, EU:C:2013:593, paragraph 116). 95 Moreover, it is not necessary that the party concerned be unable to submit evidence within the time-limit in order for additional evidence of use of the mark submitted after expiry of the time-limit referred to in Rule 22(2) of Regulation No 2868/95 to be taken into account (see, by way of analogy, judgment in Centrotherm Systemtechnik v OHIM and centrotherm Clean Solutions, paragraph 44 above, EU:C:2013:593, paragraph 117). 96 In the fourth and final place, the intervener’s claim, allegedly based on the case-law, that the Board of Appeal’s reasons might be implicit, as in paragraph 16 of the contested decision (see paragraph 15 above), cannot be upheld, since it cannot be required to provide a statement setting out in detail all the positions articulated by the parties before it. 97 It should be borne in mind in that regard that the case-law relied on by the intervener applies only on the express condition that the reasons allow, on the one hand, the persons concerned to know the reasons why the decision of the Board of Appeal was adopted and, second, the court having jurisdiction to have sufficient evidence in order to carry out its review (see, to that effect, judgment of 9 July 2008 in Reber v OHIM — Chocoladefabriken Lindt & Sprüngli (Mozart), T‑304/06, ECR, EU:T:2008:268, paragraph 55 and the case-law cited). 98 Yet it is clear from paragraphs 47 to 69 above that that requirement is not met in the present case, at the very least as regards the Board of Appeal’s decision on taking into account evidence produced for the first time before it, with the result that that case-law turns out to be inapplicable to the present case. 99 Similarly, the case-law relied on by OHIM, to the effect that a lack of statement of reasons, even if it were true, does not per se lead to annulment of the contested decision where it has no bearing on the issue of whether the contested decision is well founded (judgment of 12 September 2013 in ‘Rauscher’ Consumer Products v OHIM (Representation of a tampon), T‑492/11, EU:T:2013:421, paragraph 34), is ultimately inapplicable to the present case precisely because that condition is not met, since the impact of the failure to provide reasons as to whether the contested decision in the present case is well founded is set out in paragraphs 47 to 69 above, in particular in paragraphs 64 and 66 above. 100 In the light of all the foregoing considerations, the third plea in law is well founded in that the Board of Appeal failed to exercise its discretion in an objective, reasoned manner, to decide whether or not to take into account the supplementary evidence produced before it for the first time after the time-limit set by the Opposition Division. 101 Moreover, the issue whether or not account ought to have been taken of the supplementary evidence produced before it and since it was not examined by the Board of Appeal, it is not for this Court to rule for the first time on issues the merits of which were not examined by OHIM (see, to that effect, judgments of 5 July 2011 in Edwin v OHIM, C‑263/09 P, ECR, EU:C:2011:452, paragraphs 72 and 73; of 12 May 2010 in Beifa Group v OHIM − Schwan-Stabilo Schwanhäußer (Writing instrument), T‑148/08, ECR, EU:T:2010:190, paragraph 124; and of 14 December 2011 in Völkl v OHIM — Marker Völkl (VÖLKL), T‑504/09, ECR, EU:T:2011:739, paragraph 63 and the case-law cited). 102 It will therefore be for the Board of Appeal to assess, in keeping with the guidance from the case-law and the present judgment, taking due account of all the relevant circumstances and providing reasons for its decision on the matter, whether or not account must be taken of the additional evidence submitted by the applicant for the first time before it, in order to make the decision it is called upon to give in the action which is still pending before it (see, to that effect, judgment in Centrotherm Systemtechnik v OHIM and centrotherm Clean Solutions, paragraph 44 above, EU:C:2013:593, paragraph 119). 103 Given that the third plea is well founded, the action should be upheld and the contested decision annulled, without it being necessary to examine the first and second pleas. 104 Under Article 87(2) of the Rules of Procedure of the General Court, the unsuccessful party is to be ordered to pay the costs if they have been applied for in the successful party’s pleadings. 105 Since OHIM and the intervener have been unsuccessful, OHIM must, first of all, be ordered to bear its own costs and to pay those incurred by the applicant, in accordance with the forms of order sought by the latter; secondly, the intervener must be ordered to bear its own costs. 3. Orders Underberg AG to bear its own costs. Delivered in open court in Luxembourg on 11 December 2014.